1.Cut a square of green card to 15 x 15cm and layer with the mustard holly card cut to 14.5 x 14.5cm. 2.Trim a rectangle of green card to 10 x 13.5cm, layer and mat with tree print paper cut to 9.5 x 12.5cm, stick down on the left hand side of the card. 3.Stamp the Tatty Teddy image on a piece of white card cut to 9 x 9cm and stick to the centre of the card after layering on green card, leaving a 5mm border. 4.Die cut your Tatty Teddy image and before building the image with foam squares, stamp the teddy stamp over the main body shape to add the detail to the image. Once built stick over the stamped image. 5.Stamp the present stack on patterned paper and stick to the left of the main image, stamp on more of the top parcels and place on Tatty Teddy’s back using foam squares. 6.Add strips of washi tape to the top left hand corner and bottom right hand corner, try layering the green tape on top of the tartan tape for a different look. 7.Finish with a row of green gems and the sentiment topper. 1.Cover your Kraft card blank with the red festive font paper cut to 15 x 15cm, cut a rectangle of the mustard holly card cut to 13.5 x 7cm, stick this down on the left hand side. 2.Cut a square of Tatty Teddy print paper to 12 x 12cm and stick in the centre of the card on a slight angle. 3.Trim a rectangle of green mistletoe print paper to 3 x 6cm and cut the end to a double point before sticking on the left hand side in the centre. 4.Distress the edges of a piece of Kraft card cut to 7.5 x 12.5cm , stamp with the image of the Tatty Teddy and on tartan paper stamp the present stack , trim and glue on Tatty Teddy’s back. 5.Finish your card with a sentiment topper, gems and a cute wooden heart. 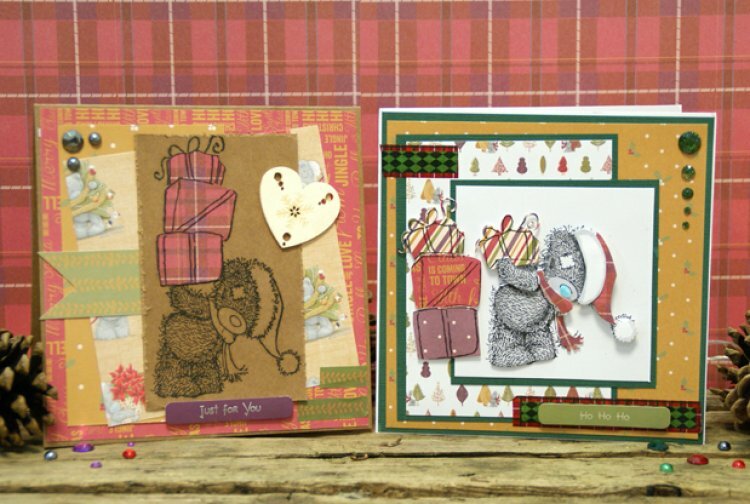 We love how versatile the Me to You die & stamp set is, you will love discovering how many different ways you can use them, share your projects with us in the project gallery.